Dust both sides of the rolled dough and your work surface with flour. 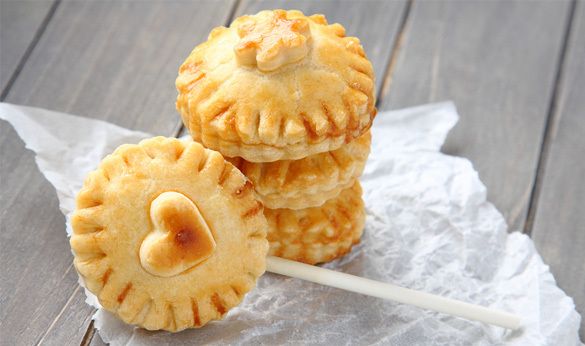 Use the cookie cutter to cut out an even amount of stamps from the rolled pie dough. To make more, re-use the scraps by combining them, rolling them out until flat with a rolling pin, and then re-cutting. Place half of the cut outs on baking sheets. Place about 1 inch of a candy stick onto each cut out, pressing lightly. Add a little less than a tablespoon of filling on top of each cut out on the baking sheet. Place 1 of the reserved cut outs on top of a cut out with a stick and filling. Using part of a candy stick or fork, crimp the edges of the cutouts together to seal them. Repeat for the remaining cut outs on the baking sheet. Using the pastry or basting brush, gently brush egg whites over each pastry. Bake in an oven at 375 degrees F for 12-15 minutes (or until the edges on the pies have browned). Let cool, making sure to be careful with the sticks while the pies are in the cooling process.